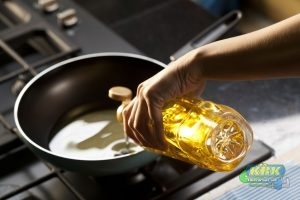 What Can I Do With Old Cooking Oil? For small or large amounts of grease, we’ve got your business covered. Anyone can use cooking oil to create their culinary masterpiece. Whether it’s a parent cooking chicken strips for their child, a fast food employee deep frying someone’s lunch, or a professional chef frying up the daily special, each has their use for cooking oil. But these oils only last for so long before they need to be replaced. Vegetable oils and animal fats all need to be discarded or disposed of eventually. Cities in Florida employ health inspectors that require businesses to have safe grease and oil disposal program. But how can a person get rid of oil and grease for their business? Does it all go in the trash, or is there a process for oil and grease recycling? How Do You Recycle Grease? If someone cooks a burger, there is usually a lot of grease left over in the pan. The person who cooked it will eventually need to get rid of it. Some people throw old grease down the sink. This isn’t a good idea. The grease will solidify and eventually create a clog, and then you’ll need a plumbing service to come take care of your drain issues. So what is the alternative? Recycling grease and oil is a relatively simple process that helps the environment by creating new uses for the waste materials. You may find yourself wondering how used oil is recycled. Both oil and grease require time to cool off before they’ll be ready for transport. Oil can be poured into a container for transport. After grease has solidified, it can be scooped or placed in to a container and moved safely. Oil still in a liquid state requires a seal-able container. Grease recycling bins are a thing if you want to go the extra mile, but the general rule of thumb for transporting it is to use an unbreakable container with a lid that creates a seal. 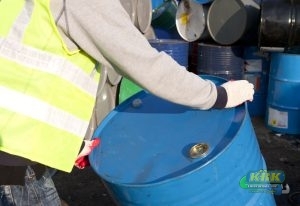 There are recycling centers that accept cooking oil and grease for disposal, or export for re-use. The way they do this is environmentally friendly, or “eco-green recycling” through various methods. What Do They Do With Old Grease? Some people may wonder what the benefits are of recycling grease and cooking oil, instead of just throwing it away. What is recycled grease used for? Weed Killer Cooking oil can be used to kill weeds that sprout up in your garden. It must be done from a spray bottle and not used for a direct pour. Bio-diesel Oils and fats can be broken down to create bio-fuels. The oils have all of the water and impurities burned out, and can be used as a clean burning alternative fuel for most diesel engines. Animal Feed Recycling facilities can export used oils and grease to countries that still use them for raising livestock. They get mixed in with other ingredients and are used to raise animals, from chickens to cows. Seeing as how cooking oil can be used to kill plants, keeping it from getting in to normal trash is the best idea. Recycling keeps used cooking oil and grease from contaminating and killing normal plants and vegetation. Supposedly small amounts of grease and oil are safe for composting, but other sources say they can create smells and attract animals if added to your home composter. What Happens to Grease from Restaurants? Fryer oil is usually changed every week, sometimes twice a week. Grease traps get filled and need to be emptied. These businesses are usually very busy, and many of the workers are not specialized in the safe handling of used oil or grease. That’s why businesses often turn to a grease recycling business to handle cleanup and disposal. Commercial amounts of grease require professionals to get that much grease to recycle locations. We have the people and the equipment to remove your grease and oil waste. This usually means a business with employees who are trained, insured, and certified, as well as tanker trucks so all of the excess waste can be hauled to processing centers. From here they can be collected and exported to Europe to be turned in to bio-diesel, or to countries that still use oil and grease in their animal feed. Essentially, oil and grease removal for businesses is the same as it is for an individual, just on a much larger scale. Fast food chains and restaurants that do large amounts of business probably require waste oil and grease removal much more frequently than their smaller counterparts. They stay on top of their oil and grease recycling just as much as they stay on their commercial heating in the colder months of the year, since failing to take care of these issues can cause a serious loss of revenue. Overall, oil and grease recycling is much better for the environment than just throwing it away. If the waste products are just thrown in the trash, there is no telling where these chemicals could wind up, or what elements of nature could be contaminated. 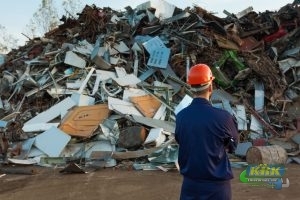 If a person wants to make the environmentally conscious decision to recycle, but is too busy to handle the oil and grease recycling themselves, a professional collection service is the answer. Anyone looking for a grease or oil collection services in Fort Pierce and Port St. Lucie, Fl should call KRK Enterprises, Inc. at 800-330-7686.